Enjoy a homemade meal of soup or stew on these cold winter nights. It's easy using Tupperware's new Pressure Cooker. Imagine five minutes of preparation, 30 minutes of cooking, and sitting down as a family to enjoy a meal together. Fast food that's healthy! Because you made it. When you cook, you're in control, and what a great way to stay on top of that resolution you made in January to have a healthier diet. Don't know how to use the Pressure Cooker? No problem--I'll show you how when you host a Tupperware party. You could even get your own Pressure Cooker for free or 1/2 price as a host! Or, better yet, learn how to use a variety of products when you open an account and attend a training session with me. 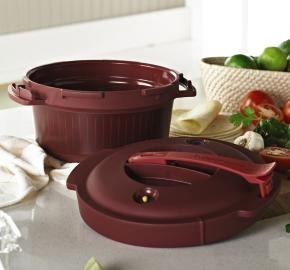 Open an account in February and get the Stack Cooker for just $30. Check out other soup-related products and more by clicking on the "Shop Away" link to the right.